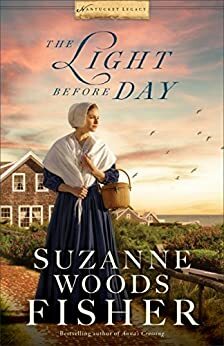 It's amazing to me how much history Suzanne Woods Fisher packed into The Light Before Day. All of it done in such a way that you feel as though you've learned a little bit of history without any effort at all. The book just flowed and kept me turning the pages. I can't imagine the deep research that was done on the issues of that time for instances slavery and equal rights, that were all brought to light in these pages. Then in the midst of all that there was a mystery, evil doings, and romance. So many great characters and I loved them all. I think I just love wise older people, so Grandpa was my favorite. Strong and caring I believe he wanted to always help the younger generation. He had a feel for people and knew when they were up to something. The ending was one I hoped for. To tell the truth I peeked when I got to the last chapter or so. I just couldn't stand the suspense. Then I went back and read what I missed and it all made sense. You know I loved the back pages of the book too where Suzanne lets you know what's true and what's not in the book. I was given a copy of this book but I was not required to post a positive review.